It is accepted that the aging process significantly impairs the ability of peripheral nerves to regenerate after injury – but the molecular pathways that prevent efficient repair remain unknown. Peripheral nerves are mainly composed of axonal processes from neurons and Schwann cells; together they build an interactive and functional unit. These peripheral nerves, which must be maintained throughout adult life, are renowned for their remarkable ability to regenerate. Regeneration requires axonal regrowth, in tandem with activation of a regenerative program by resident Schwann cells. Injury prompts Schwann cells to dedifferentiate, thus becoming "repair cells", which can then switch back to be differentiated remyelinating cells. Current thinking is that imbalances in this tightly regulated system result in age-related decline in nerve maintenance and regeneration as well as in hyper-proliferative disorders such as cancer. and utilizing novel mouse models for the study of tumor development in Neurofibromatosis type 2 disease (NF2). The Morrison lab has extensive experience in NF2 research including dissecting NF2 signaling pathways and is part of the international clinical consortium Synodos. Merlin is encoded by the neurofibromin 2 tumor suppressor gene. Although mutations in this gene were found to be the genetic cause of NF2, we still lack a complete understanding of the action of merlin - clearly a significant obstacle to our goal of delivering effective treatments to NF2 patients. We want to understand how merlin functions as a tumor suppressor. In NF2, sufferers develop tumors known as schwannomas. These are composed exclusively of Schwann cells and cover nerves and cause damage and disfiguration to the nerve as it becomes displaced. We have reached the stage where we have identified signaling pathways responsible for tumor growth in Schwann cells which lack functional merlin. Moreover, our recent studies have found evidence to suggest the tumor microenvironment of schwannomas could be an important therapeutic target for NF2. For instance, we have identified that merlin plays an important role in neuronal cell types involved in neuromorphogenesis, axon structure maintenance and communication between axons and Schwann cells. We have established that a reduction in NF2 gene dosage in axons causes damage resulting in axonal atrophy, which in turn causes neuropathic symptoms in mice. From this, we could infer that the reduction of merlin in axons, independent of the tumor burden in NF2 patients, contributes to the polyneuropathies frequently observed in these cases. Also, we showed that merlin regulates the crosstalk between axons and Schwann cells. Because of their relationship in the peripheral nervous system (PNS), we expect that these atrophic axons have a profound impact on Schwann cell behavior over time. This led us to hypothesize that reduction of merlin influences intrinsic axon function and that this specific abnormal microenvironment will influence Schwann cell behavior, possibly provoking aberrant regenerative processes as well as contributing to tumorigenesis. This is especially relevant for NF2 disease, considering that the cells also lack functional merlin, leaving them particularly vulnerable to an altered microenvironment. We think we have identified a potential tumor-promoting microenvironment for Schwann cells. 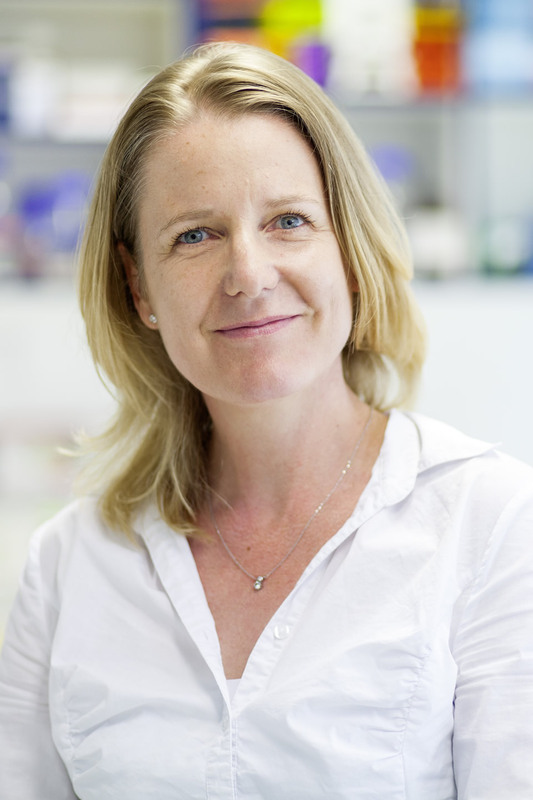 One of Helen Morrison's projects is her role as Principal Investigator at Synodos, a new international and multidisciplinary consortium of scientists, clinicians and technicians who are collaborating to develop innovative new treatments for NF2. Funded by the Children’s Tumor Foundation (CTF), Synodos is a unique organization designed to further drug discoveries with the ultimate aim of bringing new treatments to NF2 patients. Top researchers from 12 worldclass laboratories at various centers of excellence have gathered at Synodos to combine their skills and work together with a shared purpose. As the only European researcher in the consortium, Morrison is proud to be involved in this elite initiative. Her specific project is focused on applying systems biology to create tools and treatments for NF2-associated meningioma and schwannomas. The adult brain responds and adapts to the multitude of stimuli that affect its functional and structural composition. This plasticity is reliant upon a continuous modification of neurons and their wiring, whereby neuronal networks are in a constant process of adaptation, resulting in the restructuring of synaptic connections. My lab research prioritizes Ras and Ras-like protein activity control in synaptic and structural neuroplasticity - the cellular basis for memory formation. This study of activity-dependent regulation of synapse efficacy is an important pathway for the healthy aging brain. Current thinking positions mainly guanine nucleotide exchange factors (GEFs) and GTPase-activating proteins (GAPs) as the major determinants in neuronal Ras regulation. Using primary in vitro culture systems and in vivo mouse models, we will explore the newly discovered components of small GTPase activity control and their subsequent effect on neuronal plasticity within the adult brain. Beyond the intracellular neuronal signaling pathways that regulate synaptic plasticity, we are also screening astrocyte dependent specific contact signals that promote neuron maturation. In addition there is a widely held perception that the brain is a structure with limited regenerative capacity. However, it is now understood that new neurons and glia cells can be generated from stem cells within the adult central nervous system (CNS). This limited regenerative potency must be strictly controlled throughout life and is known to decline with age. Our goal is to dissect key signaling events and study the cellular components e.g. neural stem cell activity during regeneration. Our intention is to learn about the molecular pathways involved in neuroprotection and repair, to progress towards healthy brain aging as well as brain repair after injury.